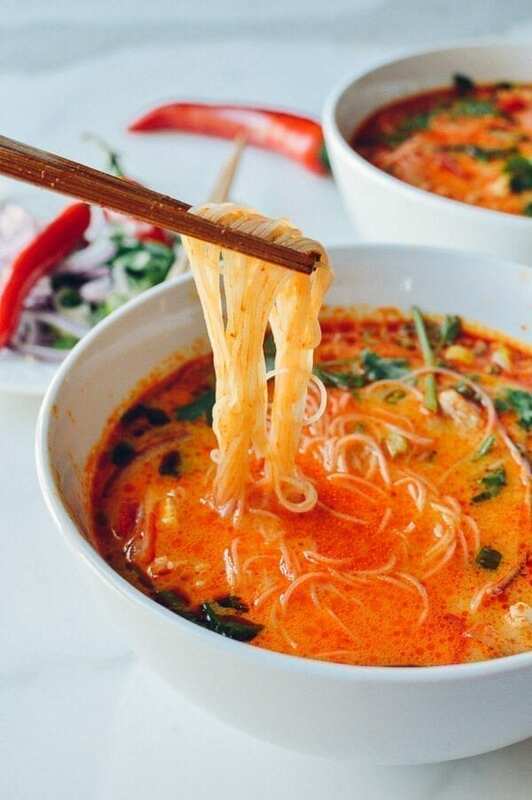 This coconut curry noodle soup is an incredibly delicious, restaurant-quality meal that takes only 15 minutes from start to finish. Make this soup at home! Add the chicken broth, water, fish sauce, and coconut milk. Bring to a boil. At this point, taste the broth for salt and adjust seasoning accordingly (add salt if needed, or if it's too salty, add a bit of water). Pour the boiling soup over the dried vermicelli noodles in your serving bowls, add a squeeze of lime juice and your garnishes, and serve. The noodles will be ready to eat in a couple minutes.